AccountingWeb’s Software Excellence Awards recognise those tools that are transforming the world of accounting for the better. 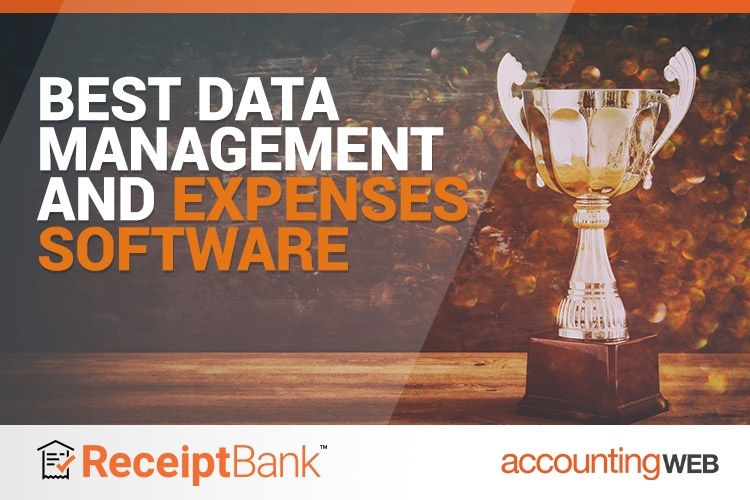 So we’re thrilled to announce that Receipt Bank has again been named best Data Management and Expenses Software of the Year. The last time we stepped onto a stage at Accounting Excellence, we swallowed our nerves at meeting number-celebrity Rachel Riley and collected the coveted award. A lot has changed since. Yet, one thing that hasn’t is our focus on our customers. The award was voted for not by a panel, but by users: those leading change in their organisation with Receipt Bank, unlocking the potential of cloud technology and loving the benefits. We work with thousands of firms all over the world to help them improve their process and reach their goals. Seeing those achievements recognised on stage is a testament to these remarkable practices. After all, it’s the forward-thinking firms who shape our technology. We listen and create around them, so more than a congratulations, this is also a thank you. The Accountancy Cloud took Innovative Firm of the Year for their consistent focus on finding new ways to work smarter for their team and their clients. It was also exciting to see software partners take home some very well deserved awards. Xero - scooping the Small Business Accounting Software of the Year, Practitioner’s Choice, and Gary Turner, who won Software & Technology Pioneer of the Year for his evangelism and inspiration for the accounting community. Our mission is to make bookkeeping effortless. That means a constant focus on improving our product so that it meets the spoken and unspoken needs of accountants and bookkeepers across the world. Here at Receipt Bank, we have a motto on a Friday evening that on the coming Monday, we get to do it all over again - but better. Incremental but unrelenting improvements is in our nature. When revolutionising accounting and bookkeeping, change will not be overnight. And nor should it. Introduced our new logo. Seven years ago, we were a plucky startup with big dreams. The new logo reflects the Receipt Bank of today - a tech company operating from every corner of the globe. Were named one of the UK’s fastest growing businesses by Deloitte and the Sunday Times. Made Xerocon one to remember. Xero are renowned not just for their beautiful technology, but also throwing an incredible conference. This year was no different. We were delighted to bring orange to the conference floor, yacht and even dance-floor to celebrate our partners and bring new firms onboard. Launched Bank Fetch in Beta. This remarkable feature automates the collection of your clients’ digital bank statements, putting them straight into your account, ready for processing. Released Invoice Fetch, to make invoice collection effortless and automated. From the get-go, this has been one of our most loved features: designed to save clients time downloading bills and invoices, instead automatically adding recurring suppliers. And we’re not stopping there. This award isn’t about resting on our laurels. It’s about reminding ourselves what we aspire to every single day. And we’re going to keep pushing to find new ways to improve the way you work. Thank you again and congratulations to all our partners! If you want to find out how our award-winning solutions can help you get where you want to go, get in touch with our team today.